A collaborative post about everyone’s favourite Italian Plumber. The weird thing is, although the little red-hatted man is famous for being a plumber, he’s actually a pretty terrible one. Sure, he’s bought his big name to the profession, but he actually doesn’t have much to offer in the way of true plumbing skills. This might all seem a bit harsh — why are we bashing Mario? After all, not everyone is great at their job. Well, we’ve got some concerns about this bloke. His antics, while entertaining, put a black mark on the plumbing trade. Plumbing requires tact, a dab hand and patience. When a part just won’t budge, when you need to spend hours carefully adjusting every valve, aggression is the last characteristic you need. Mario is a man with a lot of problems — and he solves those problems by jumping on them, smashing them with his fist, throwing them and also lobbing fire at them. Mario’s aggressive problem-solving techniques are not conducive to sound plumbing practices. This type of behaviour is guaranteed to cause damage and lead to yet more problems. Yeah, it might all seem like fun and games, but who will be laughing when Mario grows twice in size, smashes his way through your piping, jumps out through your roof and leaves water all over the place? Plumbing emergencies can spring up at any time, so having a good plumber you can call when something goes wrong is essential. But what if Mario was your plumber? Well, you’d probably be out of luck. Mario does not sit still. He is constantly on the move. He’s either travelling across the world driving in weird novelty races, flying across space, or adventuring through insane and fantastical lands. He doesn’t do the 9-5 routine and he isn’t going to be available for emergency visits. Mario is a terrible plumber because he isn’t reliable. He’s too busy swanning off around the world to make sure you, the customer, is taken care of. Like Bowser is powerless without his shell, plumbers are pretty much useless without their tools. Often loaded up with a van full of specialised equipment, a top plumber is always prepared to solve your water-based emergencies. However, when was the last time you saw Mario carrying his tools? Mario carries a lot of stuff — turtle shells, giant mushrooms, blocks of ice — but in no game is he ever wielding the classic plumber’s wrench, nor does he carry a toolbox. His mode of transportation is a little red go-kart; you can’t fit any tools in there! If Mario raced around tracks in a kitted-out van, perhaps we’d be more inclined to believe he had his equipment nearby, but he doesn’t. The only tool he regularly handles is a hammer — a thumping great big one at that. While a hammer is sometimes useful, any real plumber will tell you it isn’t the optimum tool for the intricate art of plumbing. How many Mario games have you played? How many times have you actually seen him do any plumbing? 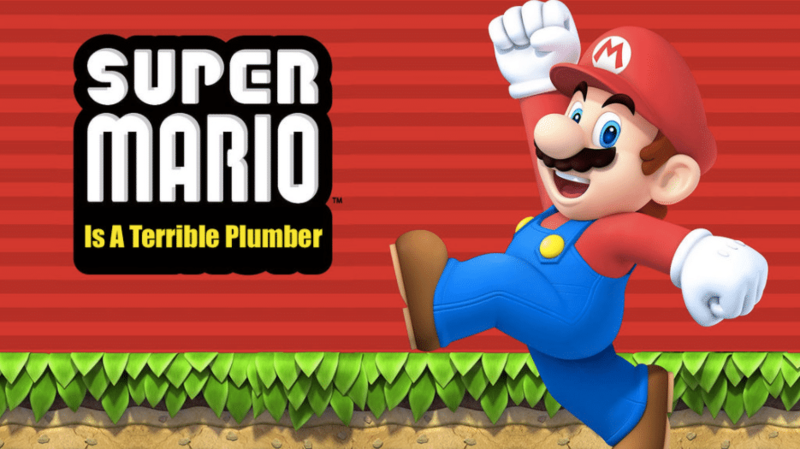 Mario has engaged in plumbing just twice in the video game series. The first in Mario and Luigi: Superstar Saga then again in Super Mario 3D World, when he and Luigi are seen fixing a pipe in the intro scene. But, not only do they bash at it like angry hammer bros; it also isn’t actually a real pipe! It’s a teleportation pipe: opaque, massive and nothing like a genuine pipe Mario might have to fix if he were to do any actual plumbing. The reason we bring this up is simple: to be a great plumber takes time, practice and commitment. Plumbing can be very complicated, which is why the trade pays so well. Mario is a terrible plumber because he is totally out of practice, would not be up-to-date with changes to modern plumbing design and would likely do more harm than good. Did you know Mario initially trained as a carpenter? Well, he did. When he first appeared in our video games consoles in the first Donkey Kong game, he was known simply as Jump Man — a run-of-the-mill carpenter. When you think about it, this career makes much more sense. The use of hammers, the love for getting aggressive (sawing is tough!) his apparent lack of interest in anything plumbing related; maybe we shouldn’t be surprised. Don’t get us wrong: we aren’t suggesting you aren’t allowed to switch career paths, but Mario seems to have got his switch incredibly wrong. Not only did he seem more suited to the carpenter role, but he’s also not put in enough time and effort into ensuring he’s up to his new job. So, Mario is a terrible plumber, but what would job would he actually be good at? Feel free to share your thoughts on Mario’s true calling in the comments! How Important is it to Run a Free Credit Report Before Tying The Knot?